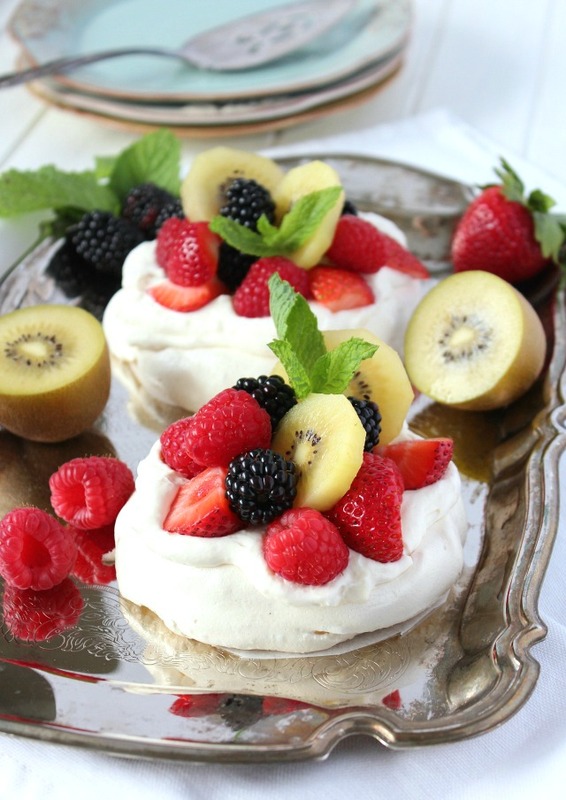 Try this easy summer pavlova recipe with light and airy meringue surrounded by a crisp crust topped with a mountain of whipped cream and fresh seasonal fruit. So delicious! You know those desserts you try for the first time and there’s no going back? For me, pavlova was love at first bite. What could be better than light and airy meringue surrounded by a crisp crust topped with a mountain of whipped cream and fresh fruit? It’s heaven on a plate. Desserts made with fruit are always my favourite in the summer. You simply cannot go wrong with strawberries, raspberries or blackberries. But, let’s not forget about the star of the show, delicious and juicy kiwifruit. Thank you to Zespri Kiwifruit for sponsoring today’s post and helping me share one of my favourite summer recipes. As always, opinions are 100% my own. Have you tried gold kiwifruit yet? Up until last week, green was the extent of my kiwi repertoire. Gold is sweeter and tastes like a cross between a mango and a strawberry. Hello! Zespri SunGold Kiwifruit can be found at your local supermarket from May to October, so keep your eyes out. You’ll recognize it by the smooth, hairless skin. We like to “Cut & Scoop” out the juicy, yellow flesh with a spoon. It doesn’t get any easier. They’re the perfect refreshing summer snack packed with Vitamin C & E, potassium and fibre. Need I say more? Don’t take my word for it, though. Whip up a batch of mini pavlova for your next family supper or dinner party and see what they have to say. I’m pretty sure the only complaint you’ll hear is that there aren’t any seconds! Cut a length of parchment paper the size of a large baking sheet. Draw 6, evenly spaced 4″ circles on the paper (tracing a bowl or jar lid). Flip paper over and place on baking sheet. Using an electric mixer, beat egg whites until soft peaks form. Gradually add sugar and cornstarch, beating until stiff (about 12 minutes depending on mixer). Beat in vanilla and vinegar. The meringue should be thick and glossy and there should be no grainy feel to the whites when rubbing between fingers. Evenly divide meringue between 6 circles, spreading evenly with the back of a spoon. Bake in oven for 35-40 minutes. Turn off heat and allow to stand in oven with the door closed for at least one hour. When completely cool, transfer to a serving plate or store in an airtight container for the next day (do not put in the fridge). Note: For a dinner party, I like to keep it as is on the parchment lined pan until just before serving. Store in the cooled oven if you can. Just don’t forget it’s there! Using an electric mixer, beat cream and maple syrup until stiff. Spoon over meringue. Arrange fruit over top, garnish with fresh mint and serve immediately. Isn’t it pretty? And gluten-free too! 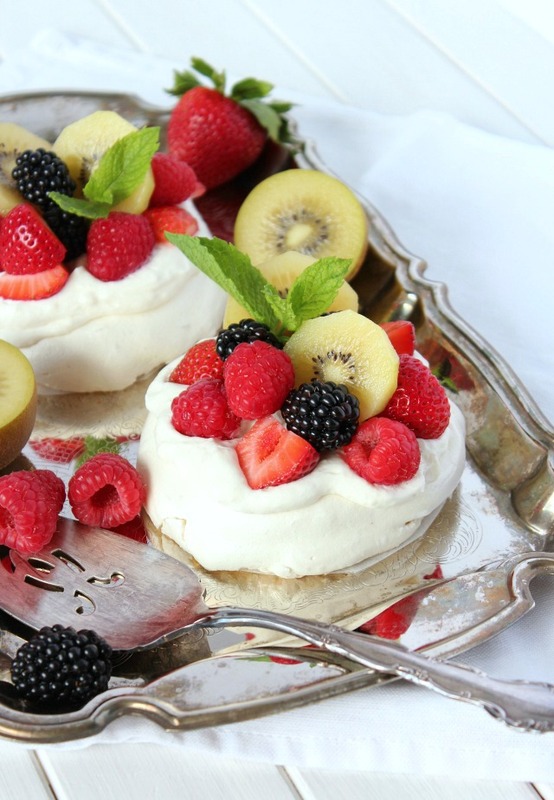 As an option, set up a pavlova dessert bar with plain meringues, a bowl of whipped cream and a platter of fruit. Not only will it save you time, but everyone will have fun putting together their own mini pavlova creations. An easy pavlova recipe with light and airy meringue surrounded by a crisp crust topped with a mountain of whipped cream and fresh seasonal fruit. Cut a length of parchment paper the size of a large baking sheet. Draw 6, evenly spaced 4" circles on the paper (tracing a bowl or jar lid). Flip paper over and place on baking sheet. When completely cool, transfer to a serving plate or store in an airtight container for the next day (do not put in the fridge). Note: For a dinner party, I like to keep it as is on the parchment lined pan until just before serving. Store in the cooled oven if you can. Just don't forget it's there! 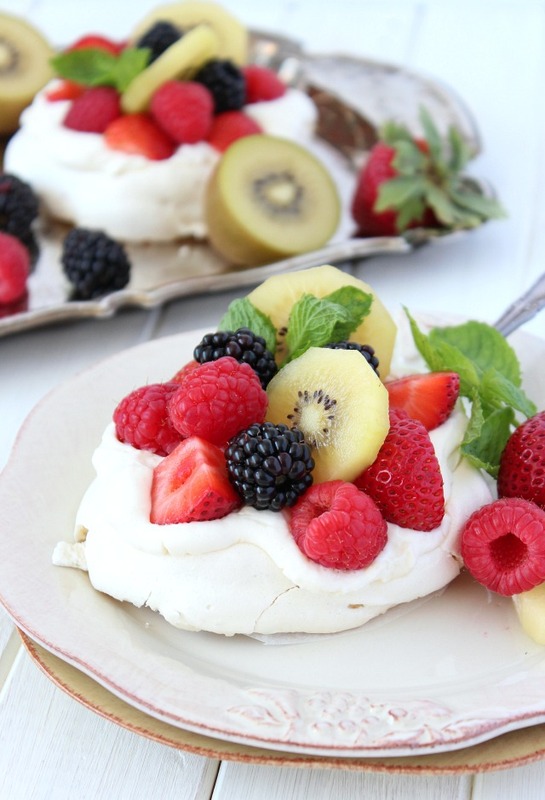 Tell me, what would you top your pavlova with? Are you a load-it-up-with-whip-cream kind of person or is fruit more your thing? I’d have to say I’m somewhere in the middle. Looking for more summer recipes? These look AMAZING!! And your photography is gorgeous. Love this so much! Beautiful! And I bet delicious too! Thank you for stopping by, Heather! Oh my gosh this looks so light and refreshing!! The fruit cancels out the sugar, right?? Oh my goodness, this just looks amazing! 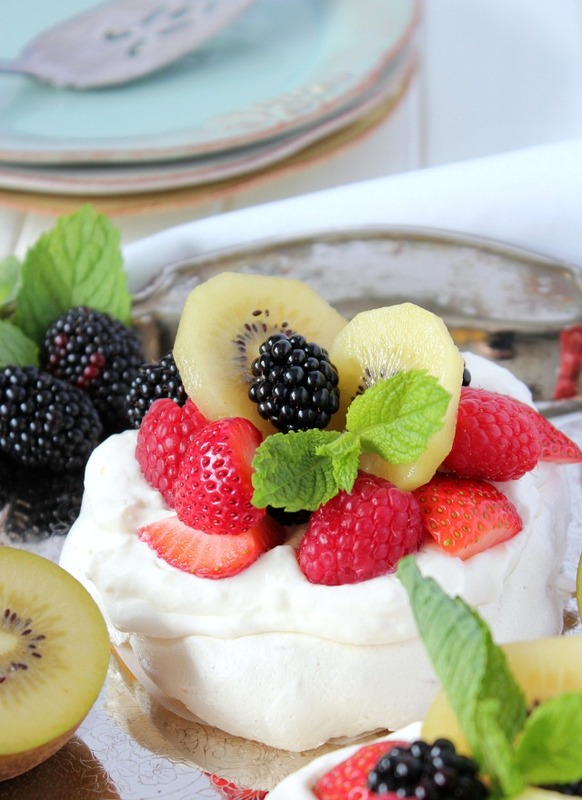 Pavlova is one of my favorites desserts! Lemon curd is my fave topping! 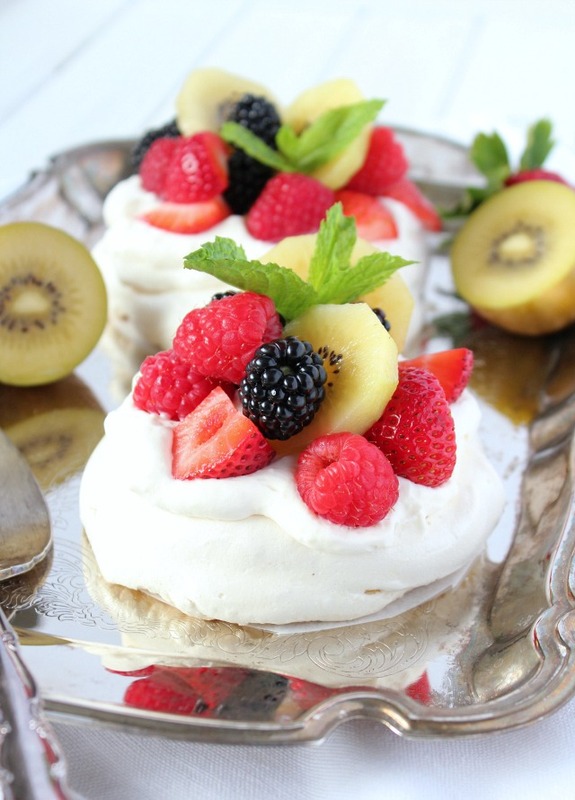 We adore pavlova too! Well, I’ve always had a soft spot for meringues. And desserts with fruit. Yours look gorgeous and delicious! A very innovative use of these gorgeous kiwis, Shauna! Super cute styling too. Fantastic work! Yum! I have never heard of Golden Kiwi before… but I love kiwi fruit… so I’m definitely going to look next time I’m shopping. And I definitely share your love for summer fruity desserts – nothing beats that! This looks like the perfect summer treat! Yum! LOVE this! Its so hard to find good simple gluten free recipes. I will have to look out for the gold kiwis!